Affordable, fast f/1.8 prime lens with manual aperture control. Offering natural image rendering and exceptional sharpness, the AF NIKKOR 50mm f/1.8D is a versatile, affordable prime lens. Extremely compact and lightweight it weighs approximately 5.5 oz (155 g) making it a convenient carry-around lens for nearly any shooting opportunity. Its aperture control ring enables smooth manual adjustments during Live View shooting, making it a great video partner, too. The AF NIKKOR 50mm f/1.8D is as versatile as it is compact perfect for travel, portraits and general photography. 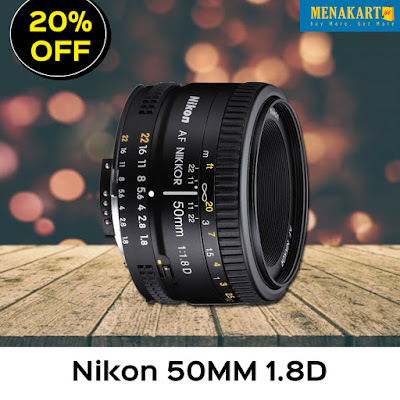 Its fast f/1.8 maxium aperture creates an attractive natural background blur (bokeh) and enables great low-light shooting. Produce consistently stunning visuals, indoors or out. The AF NIKKOR 50mm f/1.8D is fast enough for shooting in most lighting situations without a flash from dusk and dawn to dim indoor lighting. Its aperture control ring allows for manual adjustments during Live View shooting. Broaden your shooting opportunities. Online Shopping in Dubai made easy!